Some area school districts plan to review safety protocols and increase the number of police on campus following Wednesday's shootings at Marjory Stoneman Douglas High School in Parkland. Palm Beach County School Superintendent Dr. Robert Avossa tweeted: "I have directed every principal to review their safety protocols and procedures - We are working with local police agencies to have more officers at and around all District schools in the days and weeks ahead." He said in a statement that it is important to make sure students feel safe and secure. 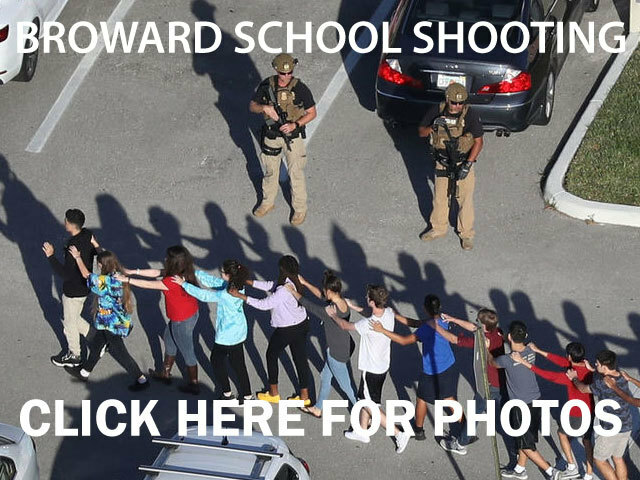 The Martin County Sheriff's Office said extra uniform personnel will be stationed at schools Thursday "to help provide peace of mind for students, parents, and staff." The sheriff's office reiterated that there are no threats to Martin County Schools and that the extra presence by law enforcement is to give everyone an added sense of security. "The heroes of the St. Lucie County Sheriff's Office stand with our other first responders and unite against these horrible acts," St. Lucie County Sheriff Ken Mascara posted on the department's Facebook page. "Our local heroes will be ever mindful of the threats to locations such as these in our community and will continue to strive each and every day to keep them, and you, safe," his message concluded.